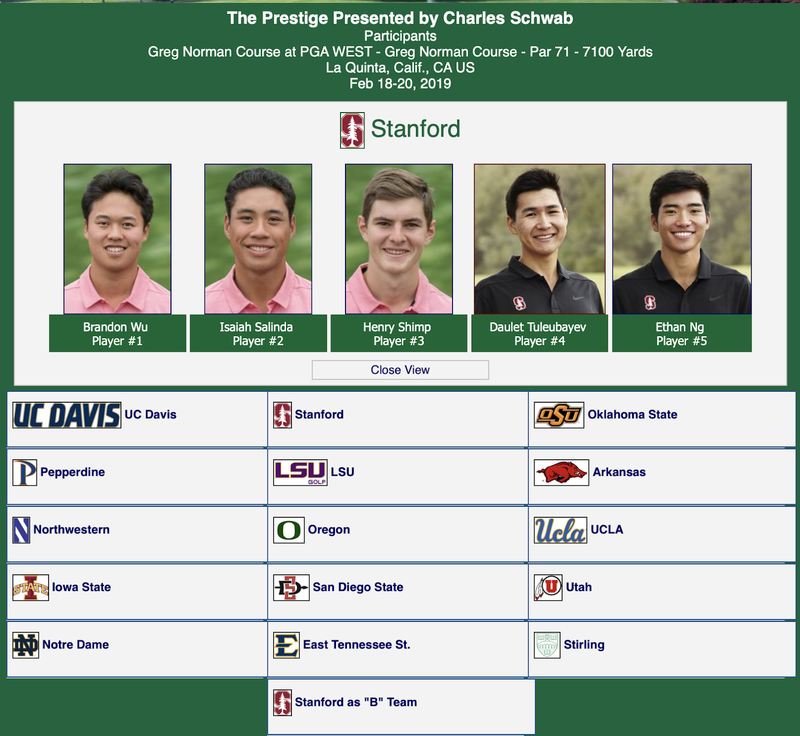 LA QUINTA, Calif. – Senior Brandon Wu matched his career best finish by placing second on Wednesday at The Prestige Presented by Charles Schwab at the Greg Norman Course at PGA West. 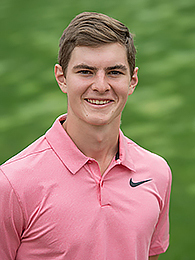 He carded three back nine birdies in cool, pressure-packed conditions and closed with an even-par 71, but came up one short to Victor Hovland of Oklahoma State, who closed with a 66. Wu completed the 54-hole tournament with a score of 7-under 206 to collect the fifth runner-up showing of his Stanford career. 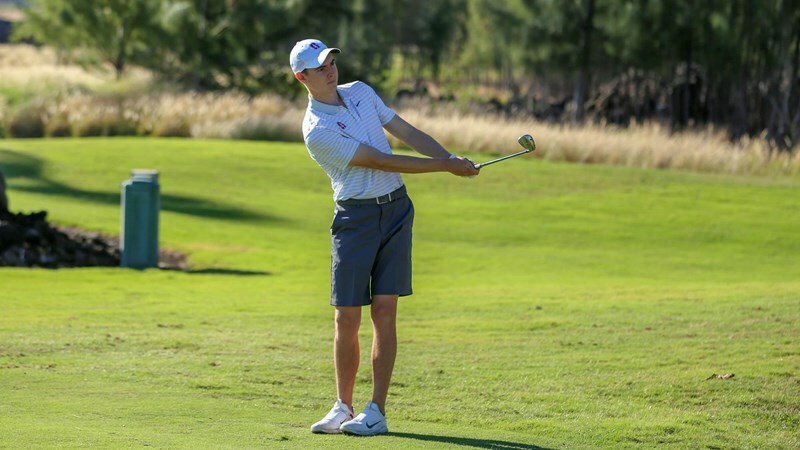 Hovland is the second-rated college player in the country and No. 4 in Official World Golf Ranking. Wu is No. 48 on the collegiate circuit and No. 36 in the World Golf Ranking. 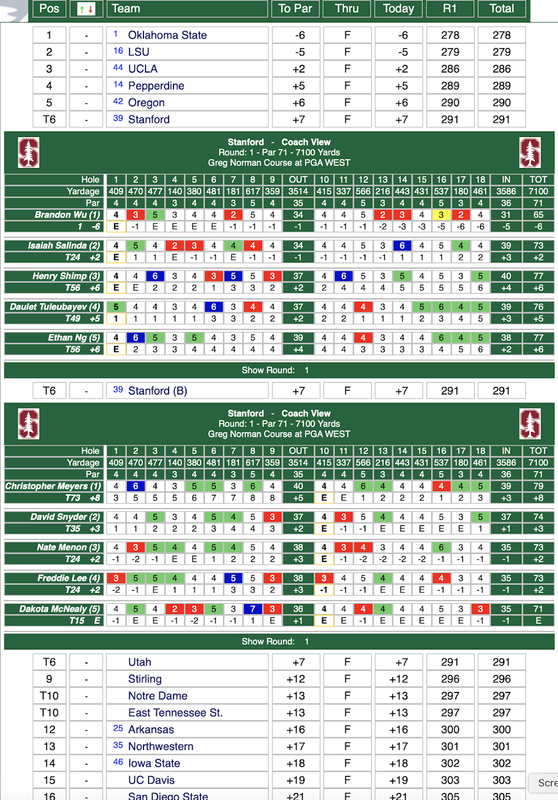 Stanford shared sixth in the 16-team event with a total of 24-over 876, combining for a strong last day total of 7-over 291. The Cardinal B squad claimed 13th at 40-over 892, shooting 308 on Wednesday. LSU won the overall crown with a 14-under total of 838, six shots clear of Oklahoma State. 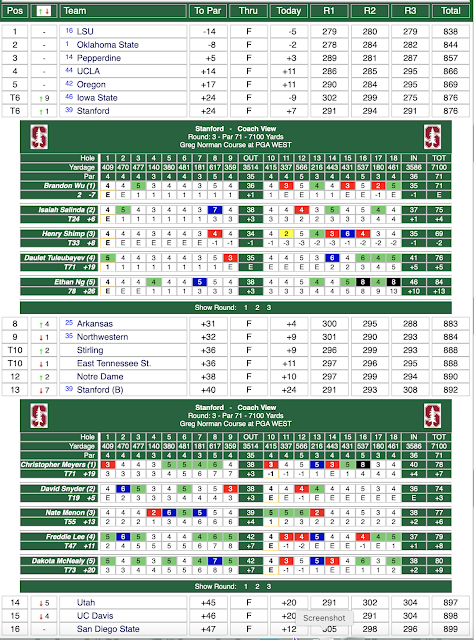 David Snyder (74) also snagged a top-20 for Stanford, finishing at 5-over 215. Isaiah Salinda(75) tied for 24th at 6-over 219, while Henry Shimp fired the team's best final round with a 69 and tied for 33rd at 8-over 221. 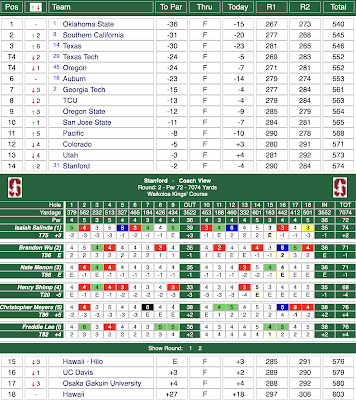 Freddie Lee (79) tied for 47th at 11-over 224, followed by Nate Menon (77), who tied for 55th at 13-over 226. 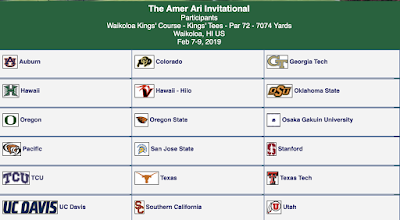 Christopher Meyers (78) and Daulet Tuleubayev (76) tied for 71st at 19-over 232, while Dakota McNealy (80) tied for 73rd at 20-over 233 and Ethan Ng (84) placed 78th at 26-over 239. 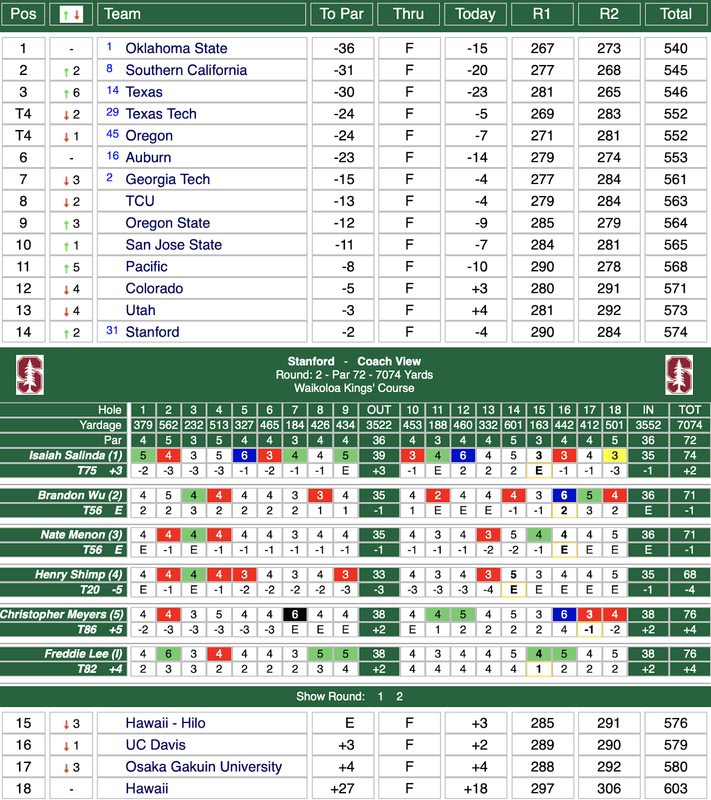 Next up for the Cardinal is the Southern Highlands Intercollegiate, March 3-5 in Las Vegas. The Prestige Presented by Charles Schwab at the Greg Norman Course at PGA West. Wu backed up Monday's pacesetting 6-under-par 65 with a 70 on Tuesday and is tied for the lead with Thomas Hutchison of host UC Davis at 7-under 135. 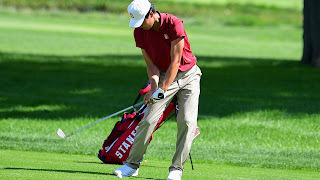 Wu, a senior, birdied the first two holes and carded four in the second round. He has four runner-up finishes during his Stanford career. Competing with two teams, the Cardinal B squad is sixth among the 16 schools with a score of 16-over 584. 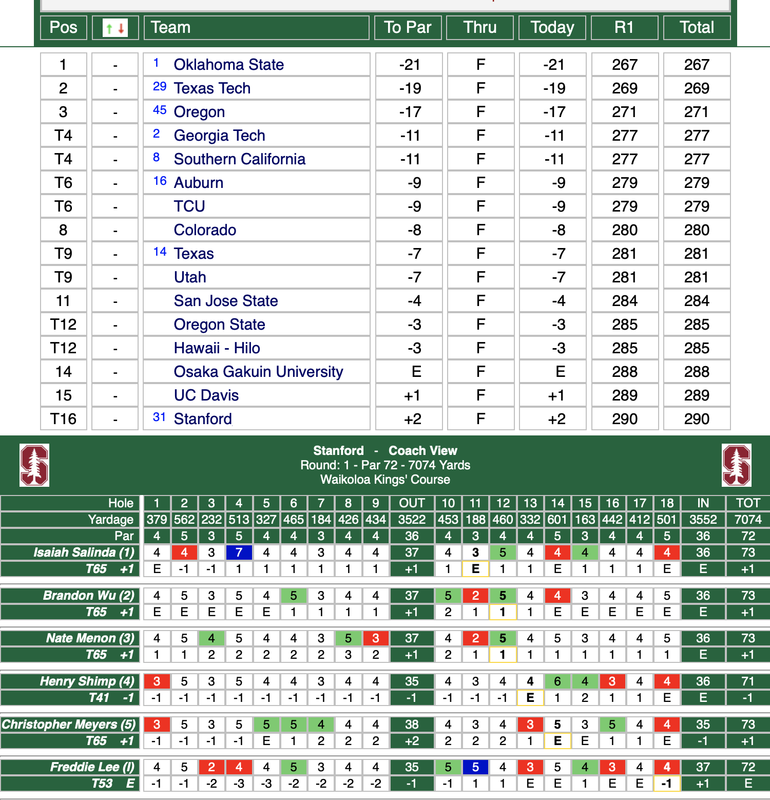 The A team is seventh at 17-over 585. 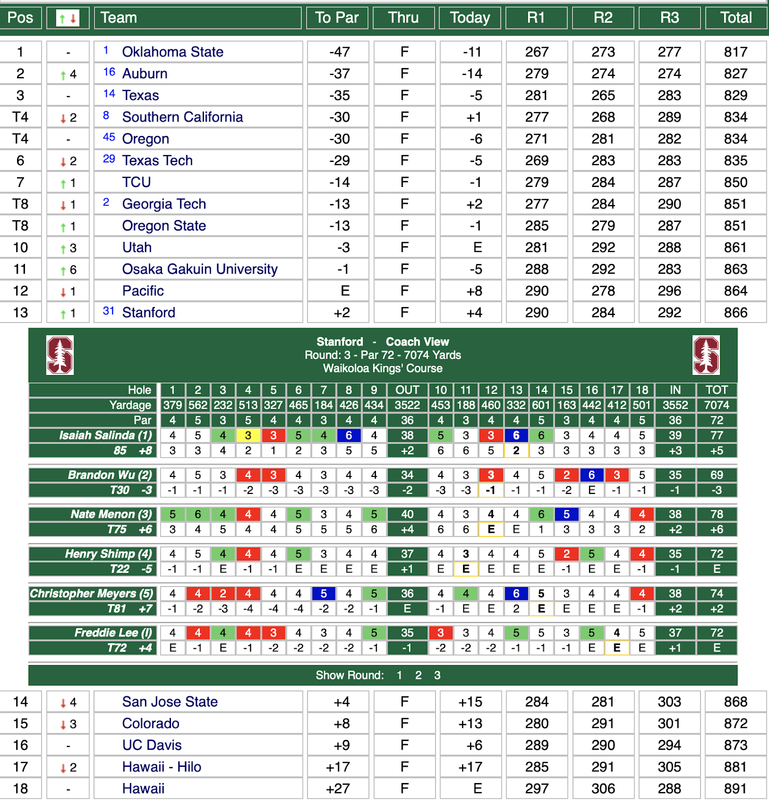 LSU leads the team competition at 9-under 559, five shots ahead of top-ranked Oklahoma State. Isaiah Salinda (71) and David Snyder (70) share 17th at 2-over 142. Salinda forged four birdies on Tuesday and Snyder had three. 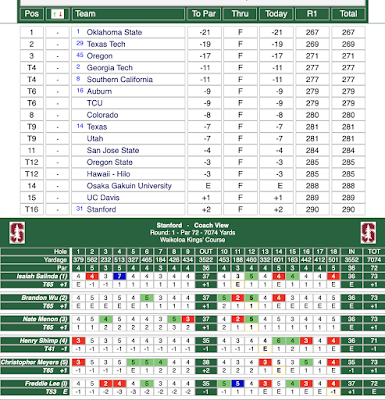 Freddie Lee (72) is tied for 24th at 145, while Nate Menon (76) is tied for 44th at 149. Henry Shimp (75) is knotted for 56th, followed by Dakota McNealy (82) in 60th, Christopher Meyers (75) in 65th, Ethan Ng (80) in 70th and Daulet Tulebayev (78) in 73rd. The final round will be played Wednesday. The Cardinal A team starts on No. 1 at 8:25 a.m., while the B unit goes off No. 10 at 9:31. 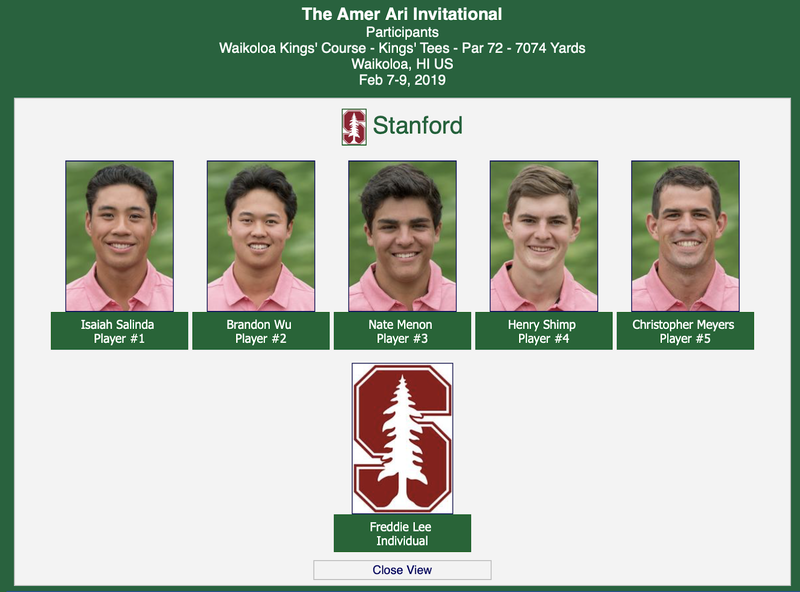 Golfweek will provide live streaming at 9 a.m.
Senior Brandon Wu shot a blazing 65 in his opening round to take the individual lead by 3 strokes. Brandon's 6-under par round included 5 birdies, an eagle and only one bogey. 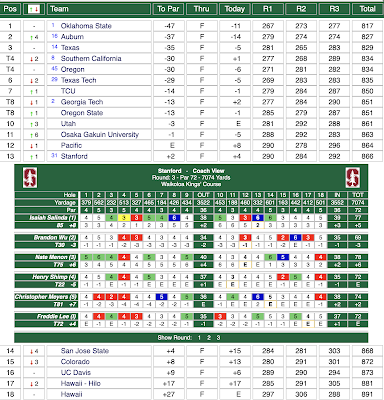 Both Stanford teams are tied for sixth place with 7-over 291 totals. Dakota McNealy, in his first round of the season, shot an even par 71 to tie for 15th position. Dakota's round also included 5 birdies. 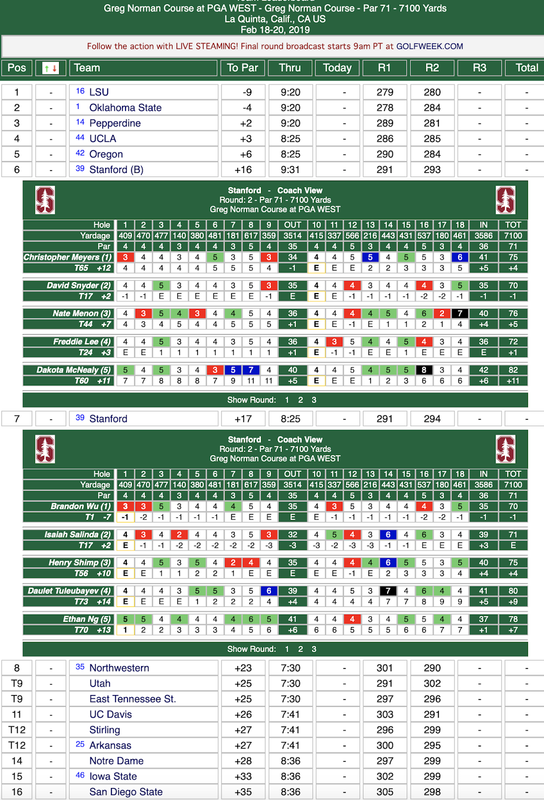 All 10 Stanford scorecards and the team totals are shown below --- click on the image to enlarge. The Stanford men's golf team swings back into action on Monday at The Prestige Presented by Charles Schwab at PGA West in La Quinta, Calif.
Fifteen teams and seven individuals will compete in the 19th annual tournament at the Greg Norman Course, including four top-20 schools, headed by defending NCAA champion Oklahoma State. For the first time, Golfweek will host live streaming coverage of the Tuesday and Wednesday rounds, with Will Haskett and Steve Scott calling the action and Lance Ringler adding analysis. 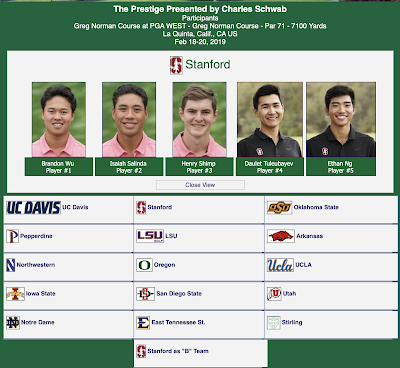 The Cardinal lineup will consist of Brandon Wu, Isaiah Salinda, Henry Shimp, Daulet Tuleubayev and Ethan Ng. 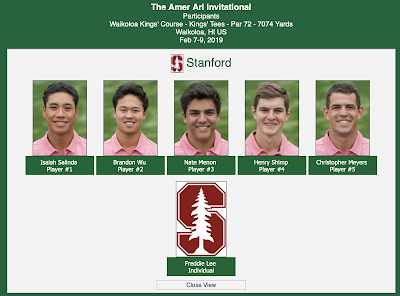 David Snyder, Christopher Meyers, Nate Menon, Freddie Lee and Dakota McNealy will participate as individuals. 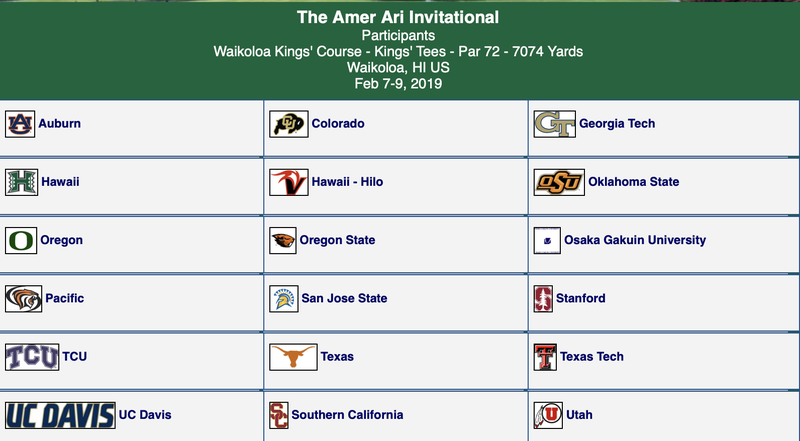 Stanford tees off Monday morning on the first tee from 8:25 a.m. to 9:09 a.m. and is paired with Oklahoma State and host UC Davis. Cardinal individuals start on the 10th tee and go from 9:31 a.m. to 9:53 a.m.
Other participating teams are No. 12 Pepperdine, No. 17 LSU, No. 18 Arkansas, East Tennessee State, Iowa State, Northwestern, Notre Dame, Oregon, San Diego State, Stirling (Scotland), UCLA and Utah. The Norman Course measures 7,100 yards and plays to a par-71.